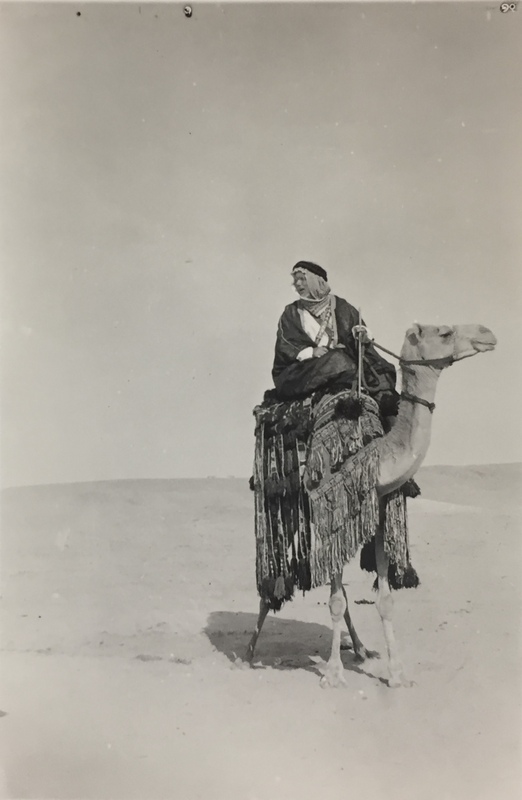 This photograph of Arthur van de Poll on camelback, taken somewhere in an Arabian desert, is only small and was discovered lost in a stack of pictures, which the Dutch National Archives say was received in 1989 from 'A.K. Widjojoadmodje' [more often spelled: 'Widjojoatmotjo] and then added to the papers of C. Adriaanse, who was the Dutch consul in Jeddah from 1931 to 1939 (2). Abdulkadir Widjojoatmodjo himself however, a graduate of Indonesian studies at Leiden University, spent time in the Hejaz from 1919 to around 1940, first as secretary of the Dutch consulate in Jeddah, then from 1932 to just before the war as vice-consul in Makkah (2)(*). He probably is the photographer of many of the pictures handed over to the archives, among which is a series made on a trip to Medina without Adriaanse. The picture here has no identification and date to it, but the face is unmistakenly that of Arthur van de Poll, who features in the same or similar clothes in several other pictures in the same files. Abdulkadir was later trapped by history at the most difficult junction of times, when in 1945 he had to mediate between Mountbatten, the Dutch and Sukarno and chose to cast his loyalty with the Dutch, even as acting governor-general, in Indonesia's war of independence (3). The Sumatra Post of March 30, 1938 mentions that 'the valuable animals from Djeddah' were given to the zoo by Mr. Neervoort van de Poll of that city. The two camels arrived the following day at their desitination to the interest of many young Indonesians. The animals had been both sea- and roadsick, is what another newspaper tells us and had lost considerable weight. Their new home would be one formerly belonging to a Banteng bull, of which the ceiling needed to be raised to a height of three meters. And then there was the issue of cattle pestilence, which was going around in the Hejaz for which the whole route from port in Djakarta to zoo in Bandung would be disinfected (4). It is however an evening edition in Holland of De Telegraaf of April 7 which printed a photo of both camels arriving at Bandoeng zoo (5). 1) Nationaal Archief, Den Haag, Collectie 406 Adriaanse, 1886-1985, nummer toegang 2.21.205.01, inventarisnummer 109. 2) 'Abdulkadir Widjojoatmodjo,' Dutch Wikipedia. Retreived October 6, 2017. 4) 'Dromedarissen,' Het Nieuws van de dag voor Nederlandsch-Indië, March 31, 1938.